Salwar Kameez is a traditional outfit in South Asia mainly in India and Pakistan. The salwar is loose pajama like trousers. Legs are wide at the top and narrow at ankle. The kameez is long shirt, often seen with western style collar. For female apparel kameez is loosely applied to collarless. Lots of variety of styles available. Region by region styles differ. Anarkali Suit: It is made up of long, frock style top and features a slim fittem bottom. It is named after the court dancer from Lahore and also became more popular after the bollywood film Mughal-e-Azam. Wedding Salwar Suits: These type of salwar suits are mainly designed to wear in wedding by adding some traditional look and designs to it. Partywear Salwar Suits: Designed for parties by adding some modern designs. Churidar Salwar Suits: This is the most popular type that are tightly fitting trousers worn by both men and women. 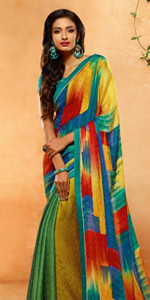 Salwars are cut wide at the topand narrow at the ankle. Palazzo: A long women's trousers cut with a loose, extremely wide leg that flares out from the waist. Straight Suits: These are made to wear at any occasion give a casual approach. At LadyBaazar you can buy designer salwar kameez online. We have listed simple, traditional and stylish salwar kameez at our store. We made your shopping easy by few click. You can sort and easily apply filters and fulfill your requirement. You will find all above mentioned type of salwar suits like partywear, designer, wedding, palazzo, churidar, kalidar, pakistani, punjabi and bollywood style. You can shop them by fabrics like silk, cotton, brasso, crepe, linen, pashmina with colors like red, blue, green, yellow, white and maroon. LadyBaazar provides best quality products with on time delivery. Worldwide delivery availble at affordable shipping cost. We offers free shipping above $400.